Highly efficient and durable storage type premium boiler, equipped with primary/secondary heat-integrated oval type fire tube, has been exported to North America. 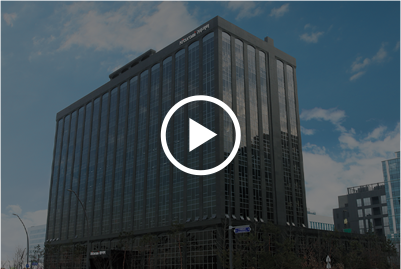 By adopting exhaust gas back draft damper to prevent external air inhaled when not in use, headwind prevention function and freeze-protection functionare built in. Storage type heat exchanger structure has half of less pressure drop thanthat of tankless type structure and circulates more quantity of heat to heat upyour room fast. 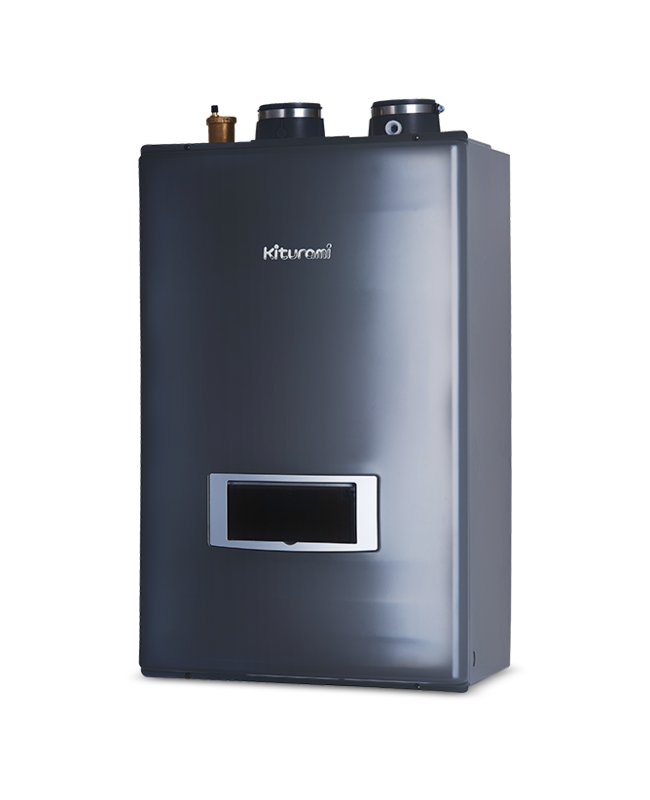 In existing medium-large boiler and water heater system,you should the whole medium-large boiler and water heatereven if you want just a little bit of heating and/or hot water.However, since cascade system lets you design capacityorganization when installing, you can operate the boiler orwater heater up to the required capacity. 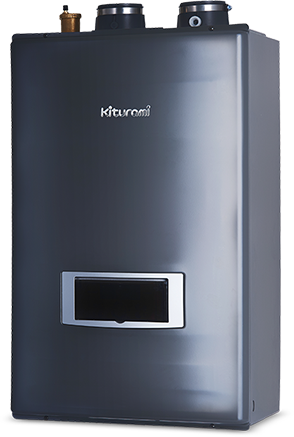 It helps you saveenergy expenses and management expenses such asmaintenance and troubleshooting. 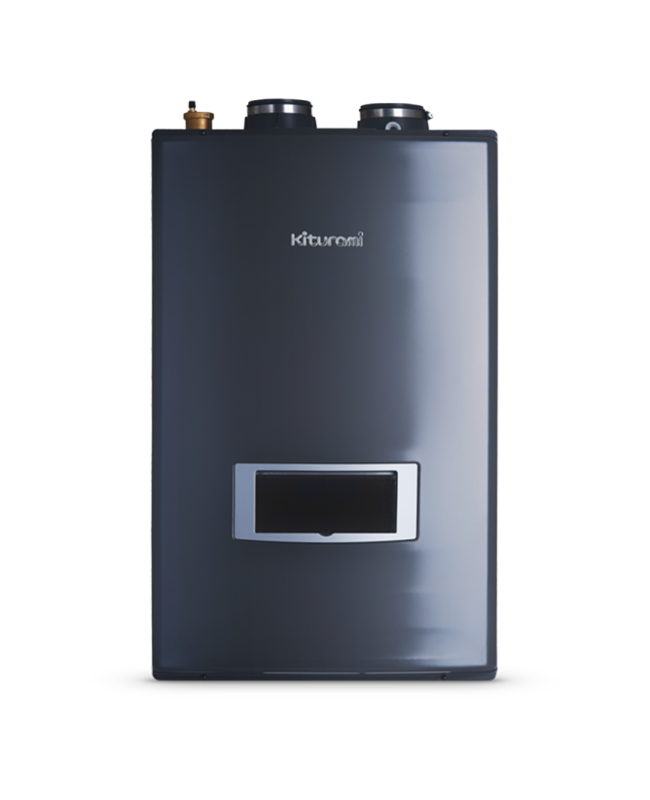 If you install a medium-large boiler, you should bear excessivetransportation charge and wastefulness expenses and needwide space. 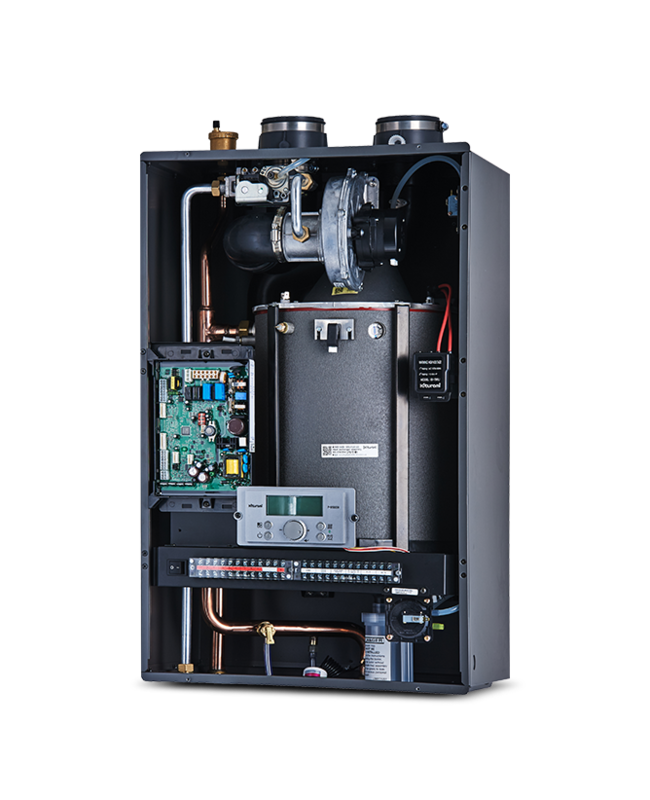 If you install Kiturami cascade system withmultiple compact wall-mount type boilers, you can make thebest use of space without special space limitations. Even if a boiler is broken, use the rest. 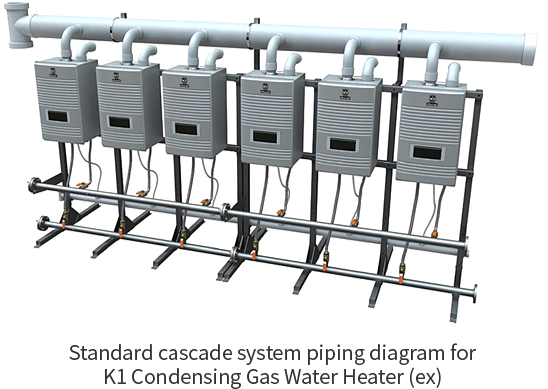 In the cascade system, multiple products are connected inparallel. If a product is broken, you can use the systemcontinuously because the rest will work normally. 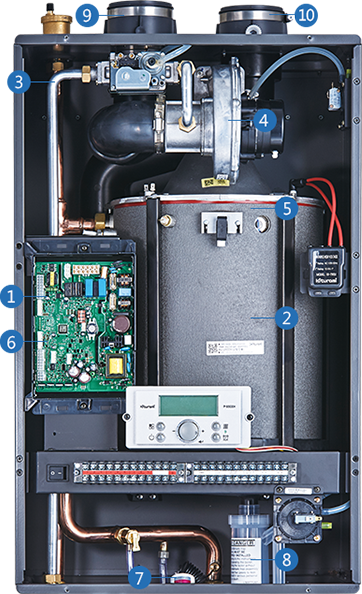 The cascade central control system lets you manipulate theproduct easily and conveniently through the computer screen.Because one temperature controller is enough to control thesystem, you don't need to ask for help from a qualified boilertechnician. ※ ASME H certified heat exchanger: achieved quality and system certificationby product according to ASME CODE SECTION Ⅳ of American Society ofMechanical Engineers (ASME) which was made to ensure safety for boilerand pressure vessel used in whole industries. Multi purpose damper with multiple functions of heatquantity control (TDR 10:1), headwind prevention,and freeze-protection is used. By adopting exhaust gas back draft damper to prevent externalair inhaled when not in use, headwind prevention function andfreeze-protection function are built in (got approval to installcomplex exhaust pipe from Korea Gas Safety Corporation).Because the storage type heat exchanger (13L) has moreirrigation capacity than that of a tankless heat exchanger(approximately 1L), you don't need to worry about overheatingor boiling. 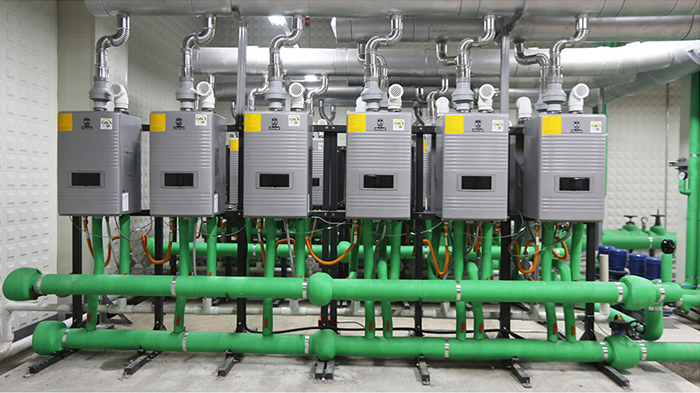 Storage type heat exchanger structure has half of less pressuredrop than that of tankless type structure and circulates morequantity of heat to heat up the room with much load ofirrigation quickly.